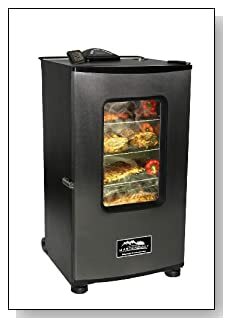 Electric smokers have become a popular choice so if your looking for the best electric smoker available we have a list of the highest rated models right here. 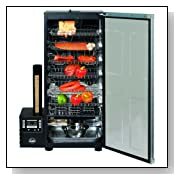 Lots of people are turning to electric smokers because they have a number of advantages. The most important reason are safety and convenience. With a traditional smoker there is always a fire going and so there is always some element of danger so you have to stand over the smoker to keep an eye on it. With an electric smoker although they still smoke the food with wood chips or pellets, there is no fire to worry about. Just switch on and let it run. And no chance of the fire going out. 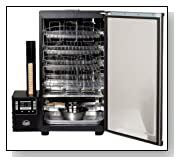 There is a large variety in the sizes of smokers and in price too. We have listed the best models in a range of prices with the cheapest being under $100 and the most expensive almost $500, so there should be a model that suits your needs whatever your budget from this list of the best rated electric smokers. The big advantage with electric smokers is that you can set them and go. The better ones even have computer controls with timer and temperature control, so that you can load them up and set a time for them to turn on at a specified temperature and duration. This makes the smoking process even easier as you do not have to keep monitoring the process and can get on with other things. Of course this kind of automation is going to come at a price, so it really depends on how much you value that kind of convenience. This highly rated smoker by Masterbuilt is one of the most popular electric smokers available right now. It comes packed with features that make your smoking experience a real joy. 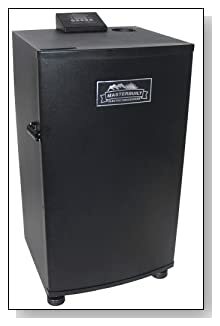 This 30 inch smoker is designed to be easy to move around, so can be used anywhere at home or if you need to take it on the road the wheels and the big handle at the back help to make this easy to maneuvre. To help with the smoking, the smoker comes with a large viewing window and an internal light. Of course this means that you dont need to open the door to check progress so no loss of heat and slowing down of the cooking time every time you need to see whats going on inside. With smoking the correct temperature is everything to getting the best out of your food. And with the built in digital thermometer that comes with this model, you always know precisely what temperature you have inside. And because this Masterbuilt smoker is nicely insulated even on the door, outside temperatures will not affect this smoker as much as some models that are more open to the elements. Measuring at 30 inches and coming with 4 racks this smoker has the potential to smoke a lot of food at one time. The other thing that many customers love about the model is the ecomony. Combined with the insulation and running on electricity you are not burning through vaste amounts of expensive charcoal to run this model. 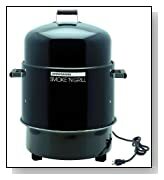 Now beause this smoker is so easy to use, it would be a great model for those that want a smoker that is less hands on. Economy wise its also much less expensive to run than a charcoal smoker, so its also a great option for those that want to smoke less expensively. Electric smokers will often cook a little faster than charcoal so be sure to check the progress of your food a bit more regularly than you would if cooking on charcoal. Always avoid overcooking, as once overcooked there is no going back. A meat thermometer is essential to check if your food is at the right temperatuer and if it is done. You cant just rely on the color of your food especially as smoking may make food look more pink or red than they would be, even when cooked. So the only sure way is to check the temperature of the food. Remember if you are using your smoker in cold temperatures this is likely to affect your cooking time as the smoker is going to lose more heat than it normally would. This applies to any smoker but more so with no electric smokers which need to be more open to the elements anyway. Also if your smoker doesnt come with one built in get a remote probe thermometer so that you know what is going on in your smoker but also in your meat. Knowing temperatures is the secret of good smoking. And make sure your probe is going into the thickest meatiest part of of the meat as far away from the bones as possible. Before putting your food in the smoker, give it about 30 minutes or so to come up to room temperature. What is a Smoker and How Do I Use One? This entry was posted in Smokers and tagged best affordable smoker, best electric smoker for the money, best electric smoker grill, best electric smoker under 200, best electric smokers under 200, best inexpensive smoker, best rated electric smokers, best smokers under 200, electric food smokers, electric smokers best, top rated electric smokers on January 15, 2013 by Jeff.